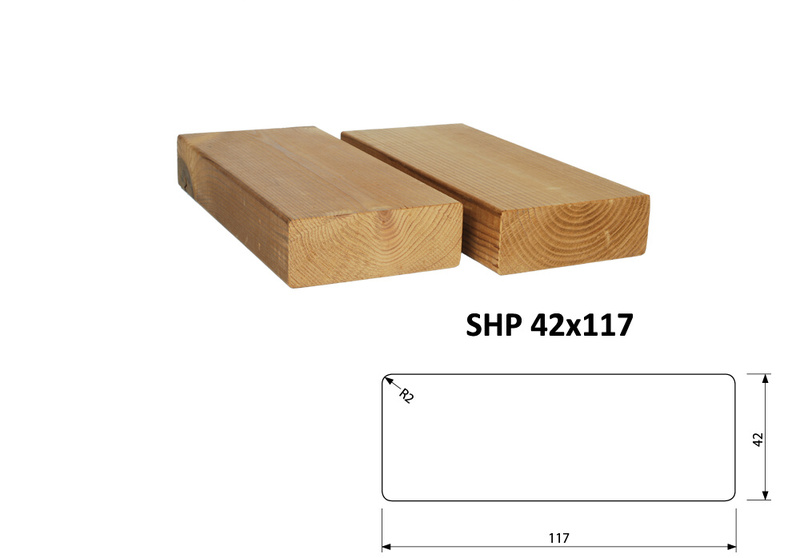 ThermoWood® is destined for terraced and swimming-pool indented beams, cladding, for production of garden furniture, for all indoor and outdoor applications and for use in humid environments. The feedstock for the production of PROWOOD wooden garden furniture is the Finnish pine which is processed to the heat-treated wood – ThermoWood® – using thermal and moisture treatment. The material modification process takes places in six chambers at temperatures of 160 - 215°C. This treated wood has new physical and mechanical properties. They mainly include longer durability (the minimum lifetime of the material is 30 years), resistance to rot, higher strength and dimensional stability. No chemical additives are used during the ThermoWood® process and the production procedure is completely environmentally friendly. Thermal modification operates entirely on energy and steam. At the end of its lifetime ThermoWood® can thus be put into alternative use or disposed of the same way as common wood. ThermoWood® is non-toxic and complies with the relevant standards and hygienic regulations. The material for production of the heat-treated pine comes from Finnish forests and is certified by PEFC system. The quality of the feedstock has a major impact on the quality of ThermoWood®. A timber class with sound knots is mostly selected for heat treatment. With regard to the success of heat treatment an initial moisture content of the wood is not important. On the first stage of heat treatment high-temperature drying takes place at temperatures of 100 – 130°C. This procedure is the most time-consuming phase of the heat-treatment process. During this phase the moisture content in the wood is reduced to nearly zero. The duration of the drying phase depends on the initial moisture content of the wood, wood species and timber thickness. For successful drying it is important to avoid internal cracks. During the drying, the water, which is loose due to the difference between the surface tension and the steam pressure, moves to the surface. to 190 – 215°C, depending on the processing level. 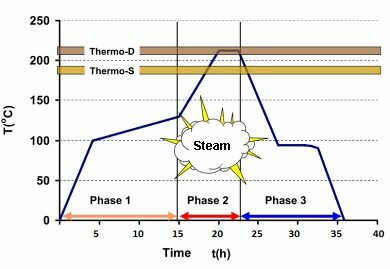 The heat treatment phase starts immediately after the high-temperature drying phase. This heat-treatment phase takes 2 – 3 hours. Steam is used during the drying and heat treatment as a protective stuff. Protective vapour prevents the wood from burning and also affects the chemical changes taking place in the wood. For the production of PROWOOD wooden garden furniture the feedstock of heat treatment Thermo-D (durability) was preferred which is treated at a temperature of 212°C ± 3°C and belongs to the class of biological resistance of D2 which is very good biological resistance and is attested by the Dutch KOMO® certificate. Long heating wood changes several of its chemical and physical properties. The change in properties is mainly caused by thermal degradation of hemicelluloses. The required changes start to appear already at about 150°C and the changes continue as the temperature is increased in stages. As a result, swelling and shrinkage due to moisture is decreased (dimensional stability is increased), biological durability and colour darkening are improved. During the heat treatment of wood several extractives (resin) flow out of the wood, the wood becomes lighter. Equilibrium moisture content and pH are decreased while thermal insulation properties are increased. However, the wood’s rigidity and strength properties are also changed. The thermal changes increase the service lifetime of the ThermoWood® material for more than 30 years without surface treatment. During the thermal process hemicellulose is degraded which serves as a source of food to decay fungi and pests. The consequence is that ThermoWood® is not attacked by these parasites. In comparison to the common wood the heat treated wood absorbs remarkably less moisture in the form of water steam. The hydroscopic equilibrium moisture content of heat treated wood is 30 - 50 % lower than that of any other kind of wood, including impregnated wood. In a temperature of approximately 20°C when the relative humidity of the air is 60 - 70 %, the equilibrium moisture content of heat treated wood is about 6 - 7 %. If the relative humidity rises to 80 %, the equilibrium moisture content of the wood is still only about 8 %. 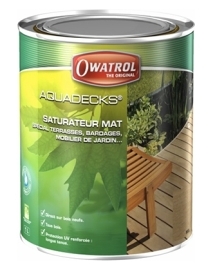 This considerably reduces the movement of the material caused by moisture and any damage that results from it. Another feature is the elimination of all wood resin during the production procedure. This makes the application of surface treatment easier and resin does not penetrate through the coating to the surface. In combination with increased stability and biological resistance the demands of maintenance can be reduced due to these interventions. But that does not mean that the heat treated wood is stable against UV radiation - the greying of the material occurs as well as by natural wood. However, if the material ThermoWood® is not treated it´s lifetime is not significantly reduced but then it is not possible to guarantee all the declared properties of the material and also not appearing any larger than capillary cracks. ThermoWood® can be assembled using screws and fasteners of a suitable size. The holes should be pre-drilled with mounting for recessing of head screws to the surface level. Screws with a smaller number of threads provide optimal bond strength. Self-drilling screws may be used without pre-drilling. When the material is applied in humid environment you have to use fitting with anti-corrosive coating. When driving the fasteners it is recommended to avoid a hammer blow in the material.